Well this is a first for me, I'm entering one of my quilts in the Blogger's Quilt Festival over at Amy's Creative Side. I decided to enter my Star Surround Cot Quilt in the Home Machine Quilted Category. The blocks for this quilt were made as part of a quiltalong at Happy Quilting last year and quilted in time for my niece's baby's arrival in February this year. I had a great time machine quilting this one as usually I do much larger quilts on my little old Janome so a cot quilt was a breeze! Its not perfect but I'm really happy with the way it turned out overall. Turned out it fit in perfectly with the nursery colour scheme! Don't you love what my niece did with the butterflies?! Nominations are open until 23rd May and voting is open between 24th May and 29th May (if you want to nominate my quilt just add the link to this blogpost here). Why not have a look at the different categories and enter one of your own quilts? That's a nice quilt . You did beautiful machine-quilting ! What a fun quilt! The colors are so fun and it looks great in the nursery! Nice job on the machine quilting, too! Nice quilt and quilting. Thanks for sharing. You did a great job with the quilting! Yes, it is just perfect for the room! Oh MY stars! The back of that quilt is as stunning as the front. Seriously beautiful ! I think you nailed that quilting. Very pretty! Great fabric choices. Oh, this is darling, Sue! 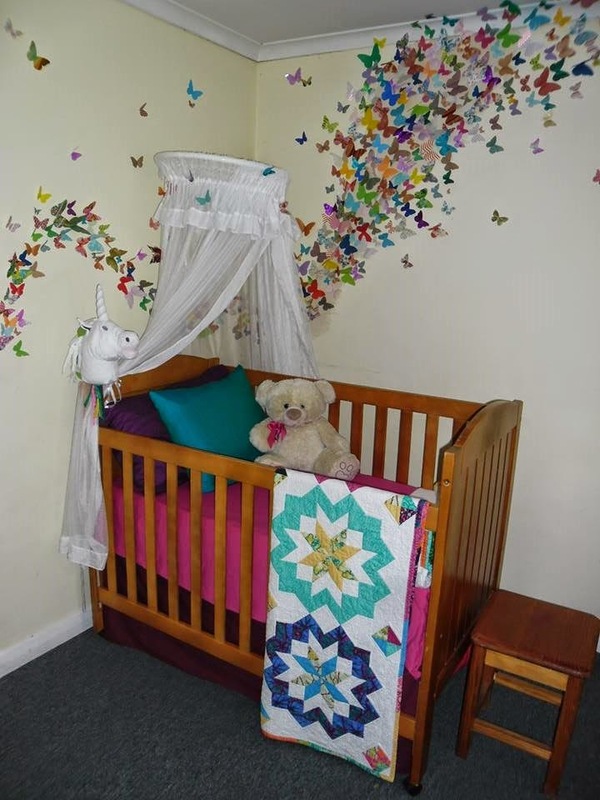 Beautiful quilt - wow, you're right - it looks perfect in the baby's room! Blogger's Quilt Festival - Voting is Open! Blogger's Quilt Festival - Pole Dancing! Swap Block for May and a Sandwich!